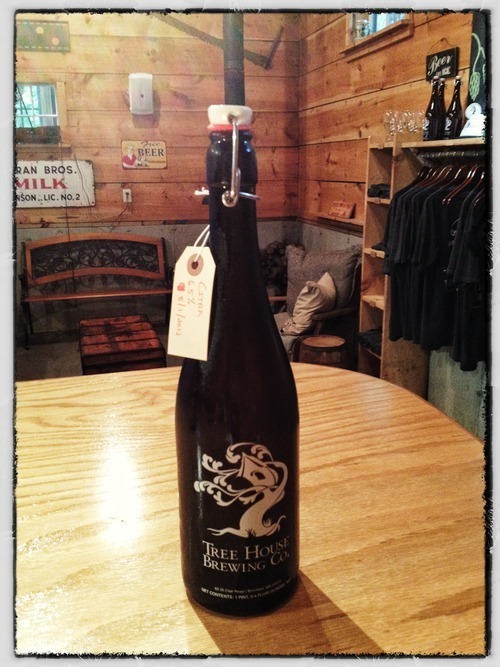 Bangin' Wednesday — Tree House Brewing Co. The first Tree House screen printed flip-top (Citra) to leave our loving hands. Thank you, John from Conway! We aren’t really open on Wednesdays, but we do brew every Wednesday and encourage folks to stop by to see what’s new. We can’t guarantee hours yet, but that didn’t stop a Saturday-like crew from making the trek last evening. In our last post we mentioned our new bottles would be available Saturday… We lied. They were available last night and we sold 12 of them (Whoa). I’m so excited to have these and I can’t wait for you to see them! Thank you for humbling us once again. The night was perfect aside from that one awkward moment where Johnny relegated himself to a corner and basked in random bird sounds on his iPhone… tweet tweet. So, about Saturday and what we’ll have available. Citra is almost gone and I wouldn’t give it more than a few hours. We just tapped the last keg of Cascade and that will be the last of our pale hoppy ales for about two weeks. Don’t miss it - It is pouring beautifully right now. There is a bit of Spawn left and Cleona, our Irish Red experiment, should be available all day. When spawn kicks? Dirty Water. On deck? That’s What She Said.